Spinaclean’s ATEX certified SkyVac high level cleaning system continues to go from strength to strength as its use gathers momentum within the milling, food manufacturing, and other sectors that are exposed to Class M combustible dusts. The system, ATEX Zone 22 certified, is now utilised within some of the world’s largest food manufacturers and reaches 12m (40ft) from the safety of the ground with one operative. The range of tools and accessories, all ATEX certified, have now been extended to cater for a variety of environments in which traditional and costly high level access equipment, such as scissor lifts and towers, cannot reach. A recent investor in the SkyVac system is Kudos Blends, is a global supplier of technically driven raising agents. 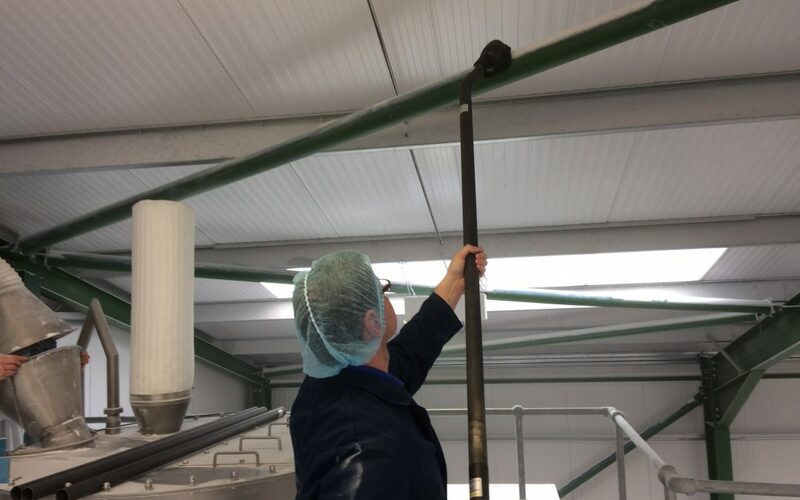 As with any large food manufacturing site, the cleaning of high level dust settled on inaccessible areas of the production site is a challenge. One option to manufacturers is to subcontract out this activity to third party suppliers but, as Kudos Blends discovered, the ease of use of the system together with the fact that no working at height safety competence is required, means that they now have greater flexibility through their own in – house Hygiene Team to conduct the cleans. Sophie Martin, Quality and Procurement Co-ordinator at Kudos says, “The SkyVac has been a fabulous piece of kit, reaching all those normally inaccessible places, meaning we can keep on top of the cleaning standards and not have to outsource”. The control and removal of combustible dusts however is only one of the key benefits of the system. The Health and Safety Executive’s statistics reveal that 37 work related fatalities in 2015/16 were as a result of falls from height. SkyVac eliminates all the risks associated from working at height and reduces the costs of the mandatory training and competence certification required in using high level access equipment.